We have our own manufacturing for HDPE /PP Ropes. We have latest machinery and automatic process for making all kind of Ropes. We are manufacturing 3 strand Z Twist ropes. These ropes are manufactured with the help of virgin quality RAW material under strict quality control for international standards. Highly Sophisticated & automated machines & modern production techniques ensure that these ropes are highly flexible & durable. HDPE ropes manufactured & supplied buy us are useful for all types of industries which include marine, fisheries, transport, shipping, utility & power transmission, engineering & construction etc. Our manufacturing Unit :Arham Polymers Pvt. Ltd. Vill : Sanand , Ahmedabad , Gujarat.Features • High breaking strength Good shock absorption • Light weight • Less water absorption • Maximum elongation Flexible • Attractive colours Specification : • Specially designed for usage of medical purpose s • Supply of fluids in medical equipment. Incepted in the year 2007, we are an evolving company operating from various cities of Gujrat. 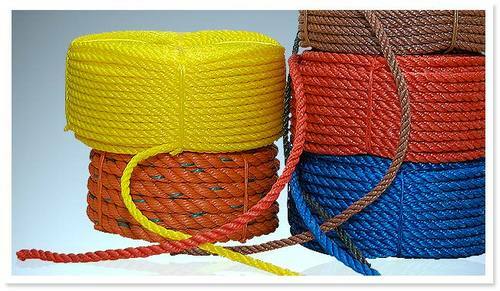 Our range of products like Ropes & Twines have been fabricated using authentic raw materials. Our range includes polyethylene ropes, high density polyethylene ropes, monofilament ropes, danline ropes, fishing ropes, polypropylene twines and industrial yarn. This has been possible due to our association with reliable vendors of the industry. The unremitting hard work of our proficient team supplemented with our modern infrastructural unit has facilitated us to match the ever evolving aspirations of our clients. This has resulted in our entrance in the markets of Yemen, U.A.E., Kuwait, Jordan , South Africa, U.S.A and Europe.